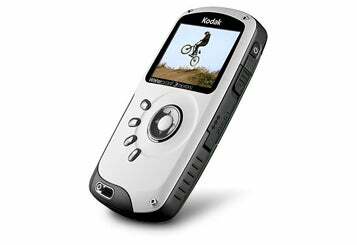 The Kodak Playsport Zx3 is a waterproof (up to ten feet deep) pocket camcorder that makes excellent videos and photos, though it has one design flaw. The Playsport Zx3 is an average-sized pocket camcorder, with dimensions of 2.3 by 4.4 by 0.8 inches. Everything you need to operate the camcorder is on its body; it doesn't use touchscreen controls. On its backside are a two-inch LCD, a record button, a playback button, a delete button, a settings button, and a navigation button ring. On its right side, hidden behind a pop-out panel, is a HDMI port, a USB port, and an AV-out port. On its left side, also hidden behind a panel, is its removeable, rechargeable Lithium-ion battery. Below the battery slot is the camera's SD card slot (a SD card is not included). In an effort to make the Playsport Zx3 easy to use, Kodak placed all of the function buttons on its body. To record/stop recording a video, you press the record button, which is surrounded by a navigation ring. Press up on the navigation ring, and the camcorder zooms in; press down, and the camcorder zooms out (4X digital zoom). Unfortunately, the navigation ring is so small that it's possible to accidentally press the record button, stopping the recording. It's best to make sure to press the buttons with the flesh of your finger, not with your fingernail. This way, you can better feel which button you are pressing when you aren't looking at the controls. The camcorder supports a maximum video resolution of 1080p. Other video recording modes include 720p at 60 frames per second (fps), 720p at 30 fps, and 848 by 480 pixels at 30 fps. You also have the choice of shooting video in black and white, or with high saturation. The Playsport Zx3 shoots 5.3-megapixel still photos at a 16:9 aspect ratio. In Macworld Lab's tests, the Playsport Zx3's video quality was given a score of Very Good (on a scale of Poor, Fair, Good, Very Good, and Superior). It does an excellent job at shooting video in bright and sunny areas, and its videos are often sharp and full of vibrant color. Its image quality is among some of the better pocket camcorders we've seen. The camcorder also does a nice job with still photos. The Playsport Zx3's photo color quality earned a Superior word score. We saw photos with good exposure and sharpness, and vibrant colors. The Playsport is also a decent audio recording device, earning a Good word score‚Äînot great, but still respectable. Though the Playsport Zx3 isn't the easiest camera to use, it does a very good job at performing its main duty: making videos. If you care more about the quality of the videos you want to make than how easy it is to operate the camera you want to make the videos with, then the Playsport Zx3 is a good choice.